The bars should be touching and the cumulative percentage line should go from corner to corner of the first bar. 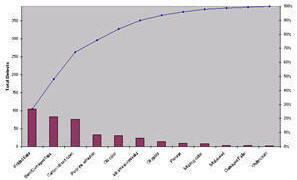 Unfortunately, most Pareto charts drawn by computer look like the following one, bars not touching and cumulative line running out of the center of the top of the first bar. This isn’t how it should be done. This isn’t the right way to draw a Pareto chart. It’s a primitive attempt, but still incorrect. 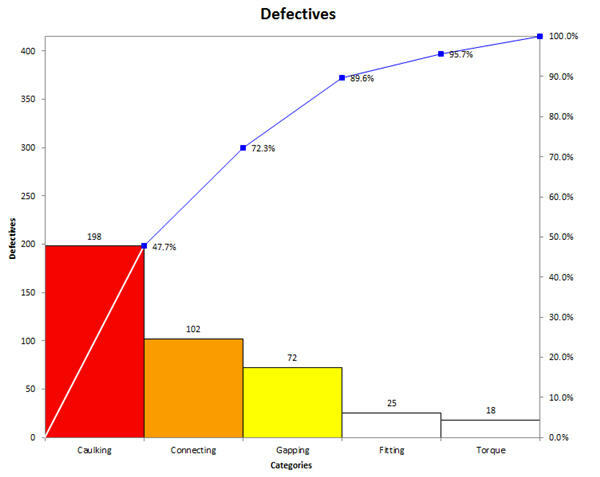 If you want people to trust your Six Sigma improvement project, isn’t it time to start drawing Pareto charts the right way? This entry was posted by Jay Arthur in QI Macros, Six Sigma and tagged Excel, Ishikawa, Pareto Chart, QIMacros, Six Sigma. Bookmark the permalink. Follow comments with the RSS feed for this post.